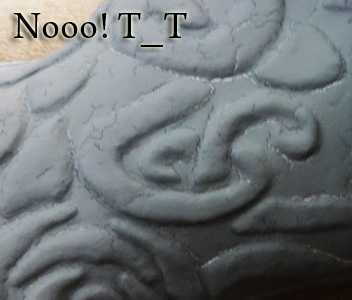 Dirili had a great way of skipping the tape-pattern method and heat-worry for armor making for your BJD’s, and explains how to make a plaster double as a first step to your armor process! This tutorial example is done using a bjd. If you are doing this on a plastic or vinyl doll, you don’t necessarily have to make a casting of the body part that you’re working on. You can form it directly on the doll since plastic and vinyl are not as sensitive to heat as resin is. Resin can discolor or weaken if exposed to too much heat. If you do not need to create a form, you can skip steps 1-3, although you may still want to do steps 1 and 2 to make sure the thermoplastic does not stick to the doll and/or to create some padding under your armor piece so that the armor will fit over clothing. 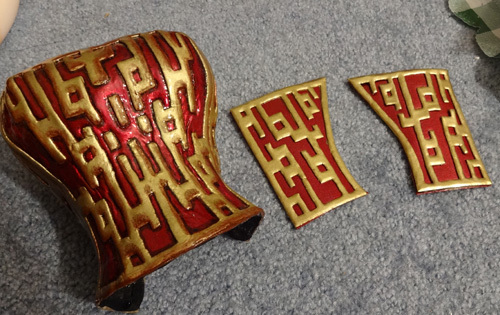 A few months ago I discovered Worbla, a thermoplastic with some amazing crafting capabilities! Comes in sheets, you can heat it and shape it and when it cools it hardens back up again. It also adheres to itself when in it’s heated state. There’s already some tutorials about the basics of using the material that are worth looking at, but since we’re working on a smaller scale for dolls we generally don’t have to worry about foam layers or doubling up so much. Wonderflex is similar, but not quite as easy to work with. It has a mesh backing so it doesn’t stretch well and it doesn’t adhere to itself as well as worbla does. But it does have it’s uses. What I’m going to write in this thread are some tips about things specific to working with worbla on dolls since dolls don’t have squishy flesh that can fit into rigid shapes. I learned from that first attempt that you can’t use a cotton stuffed duct tape dress form because it doesn’t hold the doll’s shape EXACTLY. 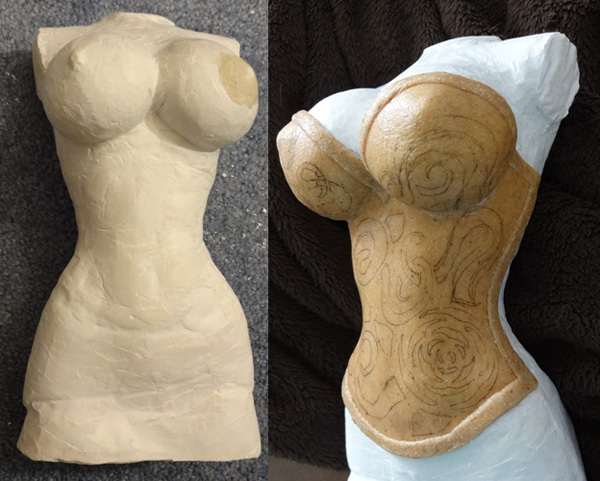 Since worbla is solid, any bumps inside it will keep it from fitting on your doll properly so you need an exact shape of your doll’s body to for your pieces on. You don’t want to form thermoplastic directly on your doll since it involves heat and a bit of adhesive. It’s not super hot since you’re handling it with your hands, but still, I hesitate to form thermoplastic directly on resin just in case. Wrap your doll in plastic wrap. Just a single layer because you don’t want to bulk things up. You’re actually sort of making a cast of the torso. Use small pieces of paper masking tape to make as smooth a cover all over the torso as you can. You use small pieces so that there aren’t wrinkles, particularly around curves and small details and crevices. Veeery carefully cut the wrap up both sides of the torso and the tops of the shoulders so that it can be removed as a front and back piece. But DON’T remove it yet. Measure and cut pieces of Wonderflex to form over the tape, doesn’t matter if you do the front or back first, but remember to maintain the seams at the sides. Use more masking tape on the edges of the Wonderflex at the sides to make sure that your front and back templates do not stick to each other. You want to make sure that you form it as close and tight as possible. Wonderflex is good for this step because it’s just strong enough to hold it’s shape while still fitting in the details. If the tape and plastic wrap came apart from the Wonderflex, that’s ok, because it should still be in the same shape and be able to be pressed back into the Wonderflex “mold”. Smooth out the insides of your mold pieces a bit. If there are some pieces of plastic that are a bit too puffy or wrinkled and sticking out, you can use some light heat to shrivel and remove it. don’t use too much heat because you don’t want the mold to soften and deform. If needed, use more paper tape inside. Mix the plaster. Since plaster can be pretty crumbly, I add elmer’s glue to the mix, about 1 part glue for 3 parts plaster should make it a bit more solid. Pour into the mold and wait for it to harden. The Elmer’s glue will likely make the plaster take longer to harden than the directions of the plaster will say. If it’s a plaster that hardens quickly, it is likely a heat curing plaster, so you want to make sure that you let it cool completely before demolding if you want to preserve your mold pieces in case you want to or might need them in the future. create your base pattern pieces on paper to make sure that they will fit right on your form before you cut your worbla. 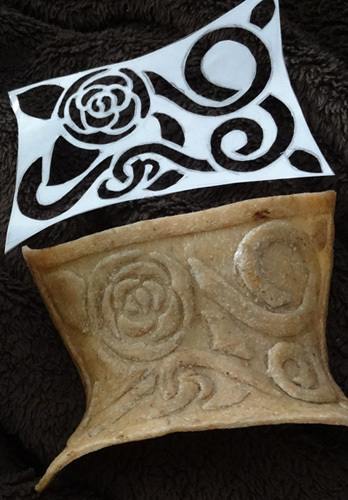 The worbla has some elasticity, but it’s fairly thin, so you don’t want to stretch it TOO much. You can press some wrinkles down too, but that’s not always easy either if it’s bunched up too much, so cutting proper patterns is key to making good fitting pieces. 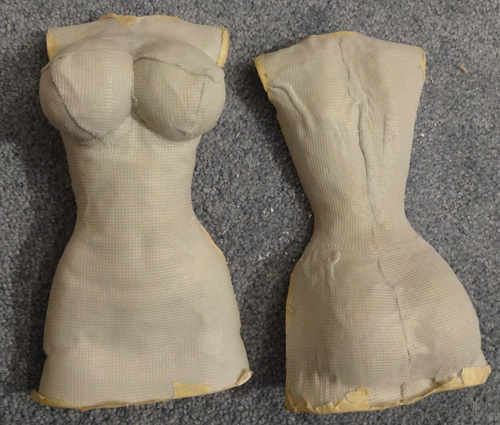 Use your heat gun, to heat one piece at a time and form them on the plaster torso. Careful not to heat it too much and burn yourself. Worbla sticks to itself VERY easily, so you have to be careful not to let it touch itself accidentally if you don’t want it to stick. You can use various tools to press any edges together. I have some sculpting tools with flat edges that I use to press things. Prime the pieces to make them smooth for painting. I like Rustoleum’s Painter’s Touch 2x coverage primer: http://www.amazon.com/gp/product/B002BWORRW/ref=oh_details_o00_s01_i00?ie=UTF8&psc=1. You will need several layers of this. Follow the directions and add as many layers as you feel you need. You can sand between priming sprays if you like. After this point, it really all depends on how you want to go about it. I like to use automobile spray paints because I want a finish kind of like Iron Man’s armor. I think it’s easiest to first spray the whole thing the color that your raised details will be. I would wait at least a day to make sure that it was completely dry and then use masking tape to cover those raised details so that you can paint or spray paint the recesses whatever color you choose. I feel that masking the raised details is easier than masking the recesses and I think that it comes off easier that way as well. But that could be subjective. Line the inside with felt. You can use various types of adhesives to stick the felt to the inside of your piece. I used hot glue on my first piece, but I was a litttle worried about any little deformations happening so I think I may try a spray adhesive with the piece I’m working on if I can get it to focus in the right area properly. Thanks again to Dirili for sharing this with us!